Pacific Symphony announced today programming and dates for the 2018-2019 Café Ludwig chamber music series. 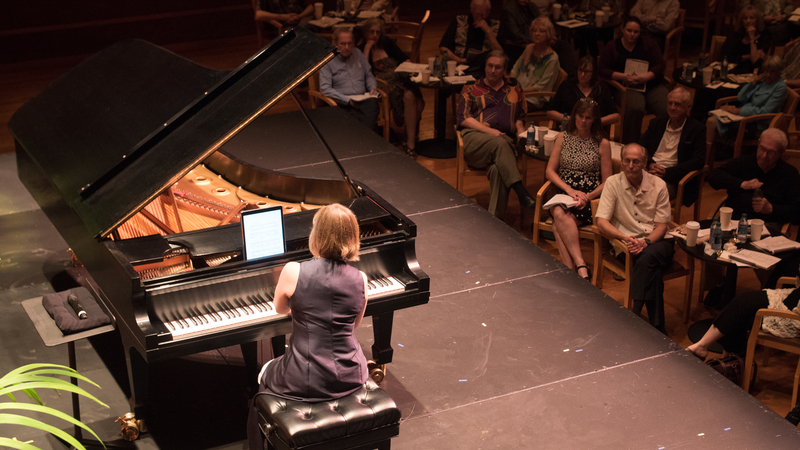 Pianist Orli Shaham will again serve as curator and host of the concerts and teams with members of the Symphony. Performances are held in Samueli Theater on Sunday afternoons. Coffee, tea and pastries are offered to listeners, seated at tables. The season’s programming is off the beaten path. The Oct. 14 opener delves into French music and features the Bassoon Sonata, Op. 168, by Saint-Saëns, the Sonata for Flute, Viola and Harp by Debussy and the Violin Sonata by Franck. The Feb. 24 (2019) concert focuses on transcriptions of Bach and includes Mozart’s arrangements for string quartet of fugues from Bach’s “Well-Tempered Clavier”; Liszt’s arrangement of the Prelude and Fugue in A minor, BWV 543; and David Robertson’s new arrangement of the “Goldberg Variations” for piano quintet. George Perle’s rarely performed “Classic Suite” for piano, which draws on Baroque dance forms, begins the program. The Symphony’s new concertmaster, yet to be named, is scheduled to perform on all three concerts. Current subscribers may renew their subscriptions online here. New subscribers may sign up here. Renewing and new subscribers may also call the box office at (714) 755-5799 to purchase subscriptions. Just a few tickets remain for the last Café Ludwig concert of this season, featuring music by Poulenc, Fauré and Rebecca Clarke, held at 3 p.m. on April 29. This entry was posted in classical music, news and tagged Bach, chamber music, Orli Shaham, piano by pacificsymphony. Bookmark the permalink.